Robert S. Arbib’s book of that name, subtitled “The Notebook of an American Soldier in Britain” was published in 1946. Arbib was an American engineer employed on airfield construction. He was also Base postal clerk whilst stationed at Debach and then Wattisham and visited Sudbury on a regular basis to pick up and drop mail. He formed a deep affection for Sudbury and its people. Among those he described with great affection were Joan Ramsey, who worked at the Post Office and lived in Queens Road, Daphne, who delivered meat for Cook’s the butchers and lived next to the Half Moon PH, and Vic Goodman, the manager of the Midland Bank. He was also a frequent guest at the Gainsborough Hotel, owned by John Merricks but run by the indefatigable Winnie Offord. A few short extracts must suffice to give a flavour of this delightful book. 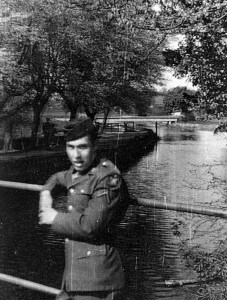 Another GI from Station 174 on the 'little bridge' - Tim Rothwell in late summer 44. 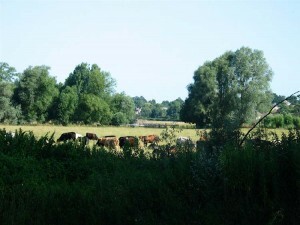 “At Sudbury the meadows are broad and green, and the river flows close to the edge of the old buildings that spring up from its eastern bank. You can walk down to the river across the green in front of St. Gregory’s church, cross a little bridge and sit on a bench under the plane trees, and look out across the meadows to the fields that rise beyond them, and the line of tall trees crowning them. You cannot get much closer to the heart of England anywhere. I sat and looked over the meadows, and lit a cigarette. Presently an old man came along with a dog, leading his cows. The cows stopped and eyed me, slowly and patiently, each in their turn, and then moved off down the path and turned over the bridge, paused, and then lumbered out on to the meadow. “Evening,” said the old man. A boy came along with a basket of apples, and offered me an apple, turning the basket to find me a bright red one. “Cox’s Orange,” he told me. “Good eating apples. You can tell when they are ripe if you hear the pips rattle.” So we shook the apples until we heard the pips rattle, and then we each ate one. “Well, tea toim,” said the boy. “Cheerio, then” and he walked away. The shadows had lengthened across the green meadows, and the water in the Stour river had darkened almost to black. You would never have known that there was a war being fought on this island and elsewhere in the world. Or that this was the twentieth, and not the seventeenth or eighteenth century. Not until you looked across the meadow again, and saw, white and ugly under a copse of willows, like one monstrous overgrown white mushroom, a concrete pillbox.